This module supports data rates from 250kbps up to 2Mbps and distances of up to 4000ft. because of a high gain 20 dBm transmit amp; a built in receive amp provides a -107 dBm receive sensitivity! These small, low-powered, 2.4 GHz transmitter-receiver modules are modest in power consumption – as low as 0.37 μA. Has anyone tested the range of the chip antenna yet? Okay, I just did a range test. I did it down the street where I live, one radio I put on top of my car, the other I walked down the street. There were some cars parked on the street and in driveways, and that combined with a curving street made the test not entirely line of sight. I was only able to get about 600 feet of good signal, after that it was a bit sketchy. At the end moving side to side a few feet put the radio back into/out of range, so I suspect that the range could be at least a few hundred more feet, if you had wide open line of sight. To restore factory defaults follow these instructions using the Synapse Portal software=> http://forums.synapse-wireless.com/showthread.php?t=281. If you are using the old XBee Explorer USB without the reset button, you would need to remove the RF266 module from the board and replug it back in to reset. If anyone happens to have one of these and a scale, could I get a weight? I'm interested in using on some RC models and every gram counts! Have you checked out this project? Has anyone been able to use the AT commands with RF266? I just connected one Module in reverse polarity , So its burnt now. Can someone help me find its internal schematic. The SNAP Reference Manual listed above for download is version K. I does not contain anything about the RF266PC1. Go to Synapse.com and download the latest SNAP Reference Manual ver. L dated 6-21-2012. It does have 3 pages on the RF266PC1 (pgs. 165-167). Synapse still doesn't have any helper/example scripts specifically for the RF266 in their Portal software, but they are planning on releasing a new version soon. Maybe it will have some scripts for the RF266. Just received 2 of these from SparkFun. I want to be able to use them with Synapse Portal but have been unable to erase the AT script that comes pre-installed on them as described in SparkFun's tutorial Synapse SNAP-RF Hints. I tried everything suggested in the tutorial to do a reset about a hundred times but nothing works. I even connected a momentary switch between RST and GND. I am using XBee Explorers WRL-09819 and WRL-08687. Over on the Synapse forum there was some discussion that USB to Serial drivers cause problems like this. It sounds like others have successfully used XBee Explorers, though. I'm waiting to hear back from Synapse support. Anyone have any suggestions or ideas? UPDATE: I resolved my problem of not being able to reset and erase my new RF266PC1âs but thought I would post this followup in case someone else runs into this issue. After several frustrating hours trying to get my 64 bit desktop (Intel Core i7-2600 CPU) computer to recognize the RF266âs, I finally dug out my old 32 bit notebook and installed Portal. Using the same SparkFun Explorers and cabling, I was immediately able to reset the RF266âs and erase the AT Commands script. Both RF266âs can now connect to Portal just fine on the 32 bit notebook. I should also say both my 64 bit desktop and 32 bit notebook are running fully updated Windows 7 and using the latest FTDI drivers for the SparkFun (USB â Serial) Explorers. Also using the latest Portal ver 2.4.31. Then I connected them back up to my 64 bit desktop expecting them to connect now that the AT Commands script had been erased. Nothing â neither would connect â both timeout. The issue seems to be that either Portal canât run on a 64 bit machine with my CPU or FTDIâs 64 bit drivers donât work. I did go to FTDIâs site and re-install their latest 64 bit driver, although it appeared to be the same one already installed. Didnât help. So, it looks like Iâm going to be running the RF266âs on my old notebook for now. Odd, I've had no problems running Portal on 64 bit Windows 7. I'm also connecting to the RF266 with FTDI drivers on an XBee Explorer. Not to say that I haven't had problems with USB drivers on Windows 7, but reinstalling the drivers when I start having problems always fixes things for me. 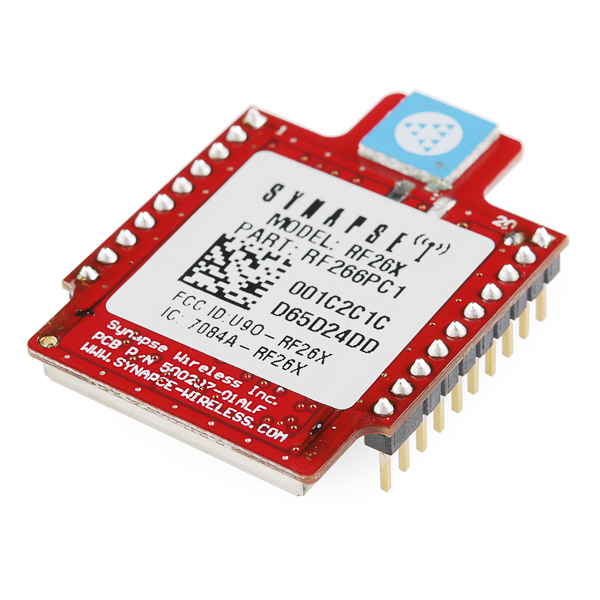 Hi, Can this device communicate with XBee series 1 or XBee series 2? No, over the air they are "speaking" very different protocols. 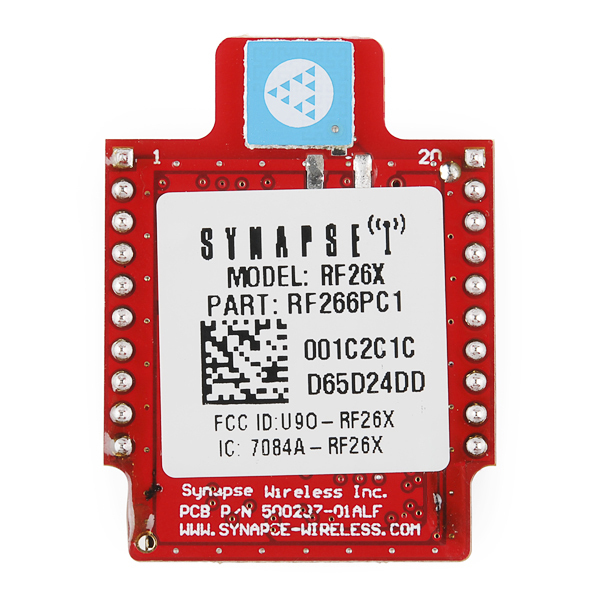 The RF266 speaks Synapse's proprietary "SNAP" protocol, and I believe the XBee devices speak some flavor of ZigBee. I suppose some sort of SERIAL PORT communications might be possible, since the serial port on the RF266 can be controlled by the loaded SNAPpy script. these are great. i love downloaded the scripts wirelessly and being able to execute and debug functions in the portal app. Worst thing about them so far is their lack of arrays - period. you have to use strings and recreate them on the fly but can quickly run out of 'buffer' space. The "SNAP Reference Manual" on the Synapse forum is newer than the one linked above (rev "L" versus rev "K"). The RF266 is covered in the newer manual. Anyone know of any getting started guides for this? I'm having trouble connecting to it. I've been using XBee, and want to switch over, but I can't get the synapse to do anything, so far. UPDATE 1: I just got it to connect with Portal! You will need to go into "Options - Erase SNAPpy image..." and for platform select RF266. When asked to restart the unit, unplug it from the XBee Explorer USB and plug it back in (or short the reset pin with ground). When the erase completes, Portal should recognize the RF266! Update 2: I still cannot get AT commands working. I read on the Synapse Forum that I may have to load a SNAPpy script to get AT commands, but when a script is loaded, portal does not recognize the RF266. (re. I just got it to connect with Portal!/I still cannot get AT commands working) The two functions are mutually exclusive. Communications with Portal uses the Packet Serial protocol built into the firmware. If the "AT commands example" SNAPpy script from www.opensnap.org is loaded into the RF266, then that script takes over the serial port. If you need to perform both serial functions at the same time, then you will need a Synapse module with two serial ports, like the RF200 or SM200. Your other option is to serially connect some other node (could even be another RF266) serially to Portal, and use that node to communicate wirelessly to the RF266 that is running the AT command script. (re. getting started guides) Go to forums.synapse-wireless.com and look for the "SNAP Primer", the "Portal Reference Guide", and perhaps one of the "kit" manuals like the EK2100 or EK2500. So, how do you get the AT commands to work? The usual '+++' doesn't seem to get its attention. Anyone have any luck with this? BTW, I have it hooked up to a Sparkfun XBee Explorer USB, and I'm connected via coolterm at 9600, 8, n, 1. Okay, I thought this would work like an xbee with extra features. I thought just hooking two up to xbee explorers would allow me to communicate serially between them without much if any effort. It doesn't seem to be that simple. If I could just find some documentation that told me the serial rate I might have a chance, unfortunately the documentation is rather sparse. Can we change the chip antenna with a RP-SMA connector ? Easily if possible ? It's for send commandes control and receive informatons, for a quadricopter (UAV, airplane). So I need a stable wireless and powerful transmission to go far. I'm little scared with a chip antenna. Else, do you recommand a RF200PD1 ? It has worse specifications and it's a non-compatible with Xbee socket. Can I buy two of these, connect one to my Mac and talk to the other using the SNAP software? If so, do I need a base board to do that? Or do I buy one of their sticks? Yep, you can definitely hook one node to your laptop with an xbee explorer and just have a xbee form-factor breakout board powering up a remote node and you will be able to talk to it and re-program it over-the-air no problem. Synapse modules are natively setup up to mesh network and a simple ping from the Portal software will find all the 2.4GHz Synapse modules in your area, assuming you have a fresh node at your laptop. The output power and sensitivity are both impressive (power is the same and sensitivity 1 dBm better than the XBee Pro 900 XSC). Assuming 1.9 dBm antennas and a 15 dBm fade margin, 3 mile range is believable, but as the poster above says that's with external dipole antennas, not chip antennas. Looks like a nice radio, definitely worth a look. It's very cool to see this product being sold by Sparkfun. 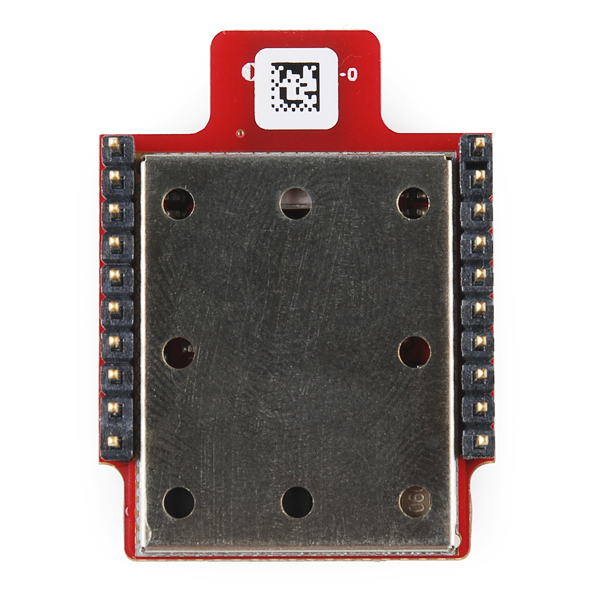 I wonder if Sparkfun would consider supporting the other Synapse modules (RF100 / RF200, etc) with a breakout board similar in concept to the XBee Explorer Regulated product. Solarbotics carries such a product, I wonder if Sparkfun would consider carrying it? What sort of throughput can you get on these? No way you're getting 3 miles range with the chip antenna. The datasheet says 4000 feet at the lowest available RF rate. This is interesting. The "product brief" from the manufacturer says "up to 3 miles" but the datasheet (as you point out) on the very same product gives the 4000 feet number. Two different specs, on the same device, in different documents from the same company. Seems like the manufacturer may have misprinted something in one of them (I suspect the 4000 ft number is probably the more correct one). Sparkfun, or someone, may need to do a double check on that. I don't think you can get that far by using only 130 mA during TX. The 3 mile LOS is for models that have an RP-SMA antenna. They make many different modules: Synapse Wireless RF Engines The 3 mile LOS range comes from models that end in PD1. I can not stress enough that this module is so much more that a simple xbee replacement. Yes, these modules ship with a SNAPpy script that acts like an XBee. However you can reprogram this module. My friend Demi works @ Synapse. It is a cool place. The last time I was there they had a skateboard ramp, in the office. They were removing it and putting up a climbing wall. Are you talking about the place in Seattle? Different company. This product is from Synapse Wireless down in Alabama. These modules can do much more than be a simple Xbee replacement. You can program this an other Synapse Wireless modules over the air using their "SNAPpy", a stripped down python. I have replaced many arduino/xbee project with just an RF200 and sensors. 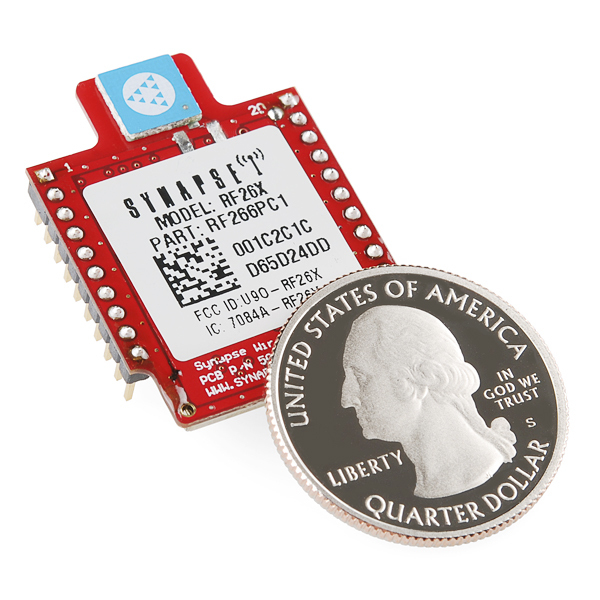 I'm glad to see Sparkfun start carrying a product from Synapse Wireless. I am not an employee, just a happy customer of Synapse Wireless. Is this product is conform for the European market(fulfills the R&TTE Directive) ? If the certification you're looking for is not in the datasheets you'll probably need to inquire directly at their home page. The first question that came to mind was if it would operate at 5V. It is a 3.3V volt device, according to a product brief that I found. This looks pretty decent though. Slap on a motor driver and a few sensors and you have a robot. Python programmable no less! Pretty much, yep. Cool build! This device is not 5 volt tolerant. Something worth mentioning, even though it is in the datasheet, this uses an ATMega128RFA1. Very easy to use and very useful, I like python scripts. Synapse did well to stay ahead of XBee with the mesh tech. XBee have just now caught up but I have a draw full of these and happy to stay with them - especially with the built in Python. Spoiler alert - plug one of these into your http://www.dfrobot.com/wiki/index.php?title=Flyduino-A_12_Servo_Controller(SKU:DFR0136) for a great little robotic setup!